This event is reserved for Maryville students, faculty and staff. 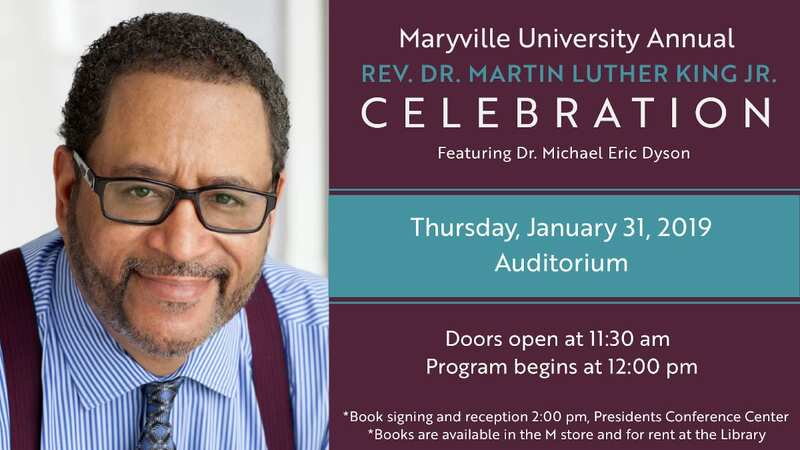 Dr. Michael Eric Dyson, a Georgetown University sociology professor, a New York Times contributing opinion writer and a contributing editor of The New Republic, and of ESPN’s The Undefeated website, will deliver the 2019 address for Maryville University’s annual Martin Luther King Jr. Celebration. Dyson’s rise from humble roots in Detroit to his present perch as a world class intellectual, noted author of 19 books, prominent leader and national media fixture testifies to his extraordinary talent. In addition to his current teaching role at Georgetown University, Dyson has taught at Brown University, The University of North Carolina at Chapel Hill, Columbia University and The University of Pennsylvania. Dyson has won many prestigious honors, including an American Book Award and two NAACP Image Awards. Ebony Magazine cited him as one of the 100 most influential African Americans, and as one of the 150 most powerful blacks in the nation. Dyson’s influence has spread far beyond his roles of renowned orator, highly sought-after lecturer and ordained Baptist minister. For the last 25 years, Dyson has also enlivened public debate across the media landscape on major television shows including “The Late Show with Stephen Colbert,” “Real Time with Bill Maher,” “Good Morning America,” and “The Today Show.” He has also appeared on NPR’s “All Things Considered” and “Talk of the Nation,” as well as several programs on ESPN. This event is reserved for Maryville students, faculty and staff. Dyson will speak on Thursday, January 31, 2019 in the Auditorium. Doors open at 11:30 a.m. and the program begins at 12 p.m. Additional seating and a live stream of the event will be located in the Donius University Center Atrium. A book signing for guests attending the program will immediately follow in the Presidents Conference Center located in Gander Dining Hall.